Nathan was born and raised in Platteville and is the son of George and Linda Curry. He is married to Crystal, a Clinical Nurse Specialist at the UW Children's Hospital. They have three daughters, Alaina, Avery and Adele. After graduating from Law School in 2005, Nathan interned for Wisconsin Supreme Court Justice David Prosser Jr. 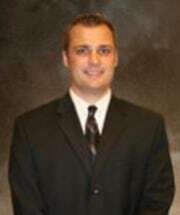 He started working for Kopp McKichan, LLP in April of 2006 and became a partner in 2011. Since returning to Platteville, Nathan has been active in his community. He currently serves as a board member for Family Connections, the Platteville Power Soccer Club and the Platteville Community Fund. He is currently serving as the President of the Platteville Community Fund, which is an organization dedicated to the support of Platteville through philanthropy. Nathan volunteers at his children's school and also coaches youth soccer teams on both the club and recreational levels. Nathan is an active member of the United Methodist Church in Platteville and serves as a member of the church's nominating committee. Nathan is an avid Brewers, Packers and Badger fan and enjoys running along with playing soccer, basketball, golf and tennis.